Taking Bookings NOW for Jan! What happens on the 1st January? You set yourself New Year Resolutions. You say THIS year things will be different.... but somehow by the 15th... your back to square one and doing the same thing - sabotaging your goals and dreams! Fail to prepare you prepare to fail. Yes I am ready!! I want to claim my €100 saving and Get my Early Bird Rate Now! Well, this year you are going to sort this once and for all, and I will help you do so. Get pre-prepared to start the new year and your new resolutions with the boost and mind-set you need! *FUN * NEW KNOWLEDGE * NEW MINDSET = NEW LIFE! You will leave having made new friends, new goals and a new and brighter understanding of your mind! IMAGINE for a moment what you would do if you were clear & focused about where you want to be? How would you feel if you had no overwhelm or fear but instead felt excited about your goals? Imagine you knew you were nearly there. Who would you be with? How would you look? What would you be doing differently? What would have changed in your outside and your inner world? This is possible, believe me. You might be wondering how, and I get that. I was the same way at one stage but when I discovered how much more productively and happily I could be living my life it was...well...freeing. By joining this 6 Week Program, you too can start to create this life, this freedom. It is ideal for you if you are feeling anyway stuck, confused, unsure of what to do next in your life. If you are feeling low in yourself, lacking in self belief or motivation and drive. If you feel that you have so much more to give and share but the feeling of overwhelm, fear and anxiety tends to take over. It is ideal for you if you want more flexibility, income and time but most of all you want to feel free of the shackles of self doubt and fear and excited about really living to your full potential. This is what I do and how I will help you. I was once this lost little abandoned girl, lacking in self belief and fearful of being alone. The voices in my head had taken over and I had no idea how to stop them. Even at 36 years of age I felt a fraud. I felt I was living a lie, hiding behind a mask and hoping people would not see I was STILL that 10 year old little girl inside. A huge eventful occurrence in my life was the catalyst for change. At the time I thought my life was over, in fact I was going to end it all, but somehow I got help and discovered how our mind works for us rather than the other way around! I started to study this and discover the way's in which I could actually help myself. It worked! 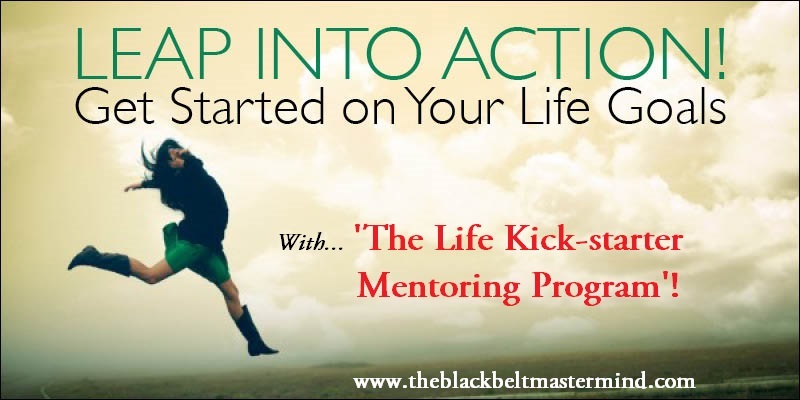 Now I am a Mind Coach & NLP Trainer and the Author of The Blackbelt MasterMind Book. I host two weekly Radio Show's on 'How to Change your Mind' and I have helped thousands of others worldwide with 1to1's, many Workshops and from the stage. Now it is time I brought it into this medium. After many requests I am making my Course more accessible worldwide with this Program!! Your Life Kick-Starter Program will guide you through all the stages you need, from day 1 to day 42. What I give you is the fundamental knowledge but even more importantly the EXPERIENCE of what it means to be in control of your own mind. This is when real lasting change really happens. When you feel and experience it. I do this with the use of conversational hypnosis and Neuro-linguistic skills. I also help and guide you through the practical, essential steps you need and also WANT to Change your Mind! You will become aware of the inside voice and the words you use and you will learn how to change it to a more beneficial one. You will also discover how much more effective your mind can be when you start to focus it in the right direction! This is NOT a wishy washy course. I have done these and was very disappointed and hurt. This course is a mixture of PROVEN factual experience and scientific data. I have been where you are. I am a REAL person with real feelings and I know what it is like to feel taken advantage of. This is WHY I am now doing this. I want to help you and show you how no one should feel this bad. You are capable of being and doing so much more. It is important for me to deliver this message and keep my promise to you. * INDIVIDUAL Evaluation Form for you & my feedback advice & suggestions. * Weekly Email and SPECIFIC tasks for YOU, & exercises for the week ahead. * Weekly FB LIVE chat catch up on messenger - to help you get clear and focused and feeling awesome! * With Q & A; Interactive time, etc etc. * Learn the basics of NLP. * Learn HOW your brain works for you. *Experience Conversational Hypnosis, & NLP. * Enjoy the benefits of Mindfulness and Visualisation exercises. Interactive experience so you can ask all your questions! * Entry into a Private Exclusive FaceBook Group! I promise to OVER DELIVER as usual and give you 100% of my expertise and knowledge. .... and after? You will think ... surely that’s it?? NO, absolutely not. As I said I am real and I hope to someday meet you in person. After the 6 weeks you will continue to be in the inner circle and will be invited to join another secret FB group 'The BlackBelt MasterMinds' and have direct contact to ask me and other students of mine, questions etc as you will. What results I will have! What RESULTS will you have by attending this Course? * You will become crystal clear about your vision. * You will gain HUGE knowledge and insight into how your mind works for YOU! * You will have more clarity, confidence and self belief. * You will be motivated and excited to go out and achieve your dreams. *You will have learn't some of the fundamentals of NLP and know how to use your brain for YOU! * You will have a clear, detailed plan and be implementing practical steps to achieve your goals. * You will be free of stress, worry and overwhelm and be feeling awesome! What is REALLY SPECIAL about this Program?? I designed this after I experienced giving up many times. I would buy a course but then be met by overwhelm when I seen the amount of work that had to be done. Have you done this before also? How many times do people buy stuff and then give up. Some don't even start! What is different with your Life Kick-Starter Program is that I now know the psychology of what motivates us! This course is easy, fun and interesting. It is not hard work but simply an effective, exciting way to create change in your life. You won't feel daunted because I will drip feed you the information exactly when and how I know you need and want it. All you will feel is more and more curious, excited and enthusiastic to fulfill the tasks on this Program. If this sounds like something you want then book now! I am only taking 10 people for this, so I can give you my all. After which it will be €397. NB: Please remember though there are only 10 spaces!! So it is 1st come 1st served! Make sure you grab your place now and let's get started! Yes! Give me my Saving of €100 and my PRE Early Bird Rate!